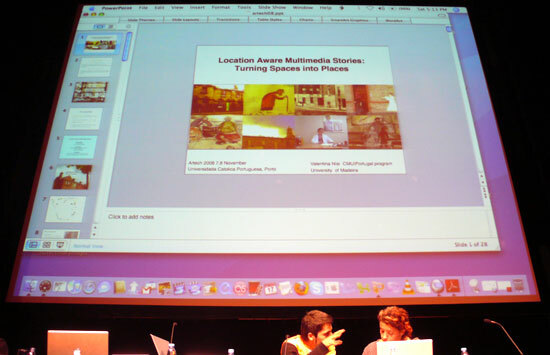 Excellent session on digital narratives this Saturday at Artech. Valentina Nisi spoke on how a space becomes a place (i.e. a socially charged location) through the use of digital media. Porto needs to become a case study on this. Actually, given the pattern taking shape after Future Places and this session at Artech, I´m tempted to say it is inevitable. Mia Makela complements the challenge by positing the importance that live cinema may acquire, thus hinting at the possibility that Portugal may finally fulfill its vocation of an ideal provider of film scenarios. Ana Boa-Ventura will wrap up the session shortly and, no doubt, brilliantly. < Autodigest returns… illegaler than ever!